To usher in the beginning of October, the online retailing giant Amazon introduces a revamped line of Kindle products . Is it finally time to get rid of our lowly books of paper? Not quite. If you’re hoping for a product review , this is the wrong place to look. Ever since the Kindle was first introduced  in 2007, the hype over this thing brought forth doom for books made from measly paper. Students today can even benefit from renting textbooks  via Kindle, which can seriously lower book costs. However, the Kindle can never replace a book. Yes, the ability to carry a whole library with you seems impressive … so why doesn’t everyone do it? Last time we checked real books don’t suffer from glitches and lack of battery. No matter how impressive the Kindle’s battery life is, it’s still a “book” you need to charge. No electricity? Too bad, so sad. Why bother with Kindle? Quite honestly, no one really needs an iPod, just as no one really needs a Kindle. And the Kindle Fire ? Amazon wants a tasty piece of the tablet market as well. 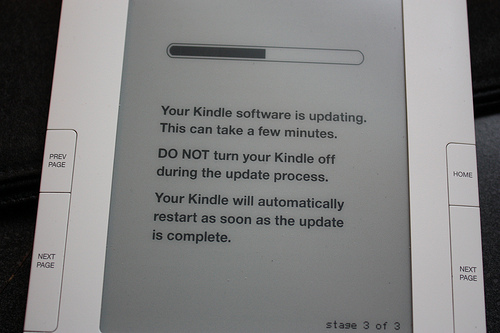 So before buying a shiny, new Kindle, think about your lifestyle. Carry around a bunch of books like an overzealous nerd? A Kindle might be for you. Don’t even own enough books into double digits? Don’t bother. The page turning is slow as molasses anyway.